Regular followers of my blog will have noticed that there has been nothing posted since the beginning of the month. This is due to continued suffering with chronic bronchitis followed by technical problems with the browser versus WordPress platforms. Fortunately my great friend has come to the rescue and I am back! 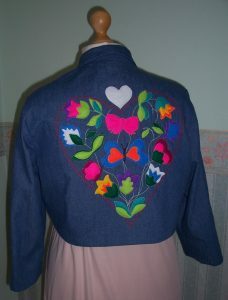 Back in 2017 I made this ‘not-so-subtle’ felt appliqued bolero-style jacket in denim. I particularly enjoyed the process. I have had a Black Corduroy Pinafore Dress cut out/ready to sew for over a year now and decided that what it needed was some decoration. In my book ‘more is definitely more’ and so I have embarked on a mammoth process of felt applique for what will be an ‘in your face’ decorated dress. 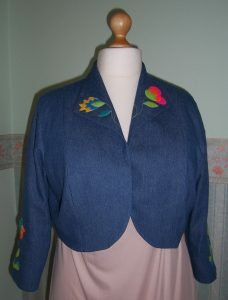 So far I have made the back and front bodice panels. I basted the pieces together to check fit and as it was fine, made up a lining in Black acetate fabric. The bodice and lining are now stitched together and on the mannequin whilst I proceed with decoration of the skirt. This may take some time……. Oh oh, can’t seem to load the pictures of work in progress. Maybe later!